In my earlier post: It happened in India , I mentioned that I shall re-read this book & post the reviews of selected topics as I read them. Book Review : It Happened in India by Kishore Biyani with Dipayan Baishya. This book is a winner from the word Go. 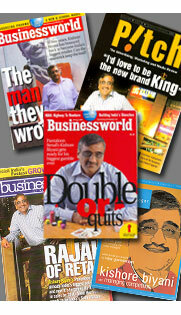 True to his style & philosophy, Kishore Biyani has included all the people in the book who have made his happen. Not just by mentioning their names, but by interviewing more than hundred people, getting their thoughts in the form of ‘their stories & versions’, in each chapter of the book. Their narrative is appropriately placed within each chapter & their thoughts on that particular topic give a insight from the very people who were involved at that particular stage of the project. To me, personally the most important part in the book were his views on Trust & Relationships. These are from pages 192 to 197. I would request you to re-read these pages a couple of times & analyze as to how you or your organization correlates to this. These pages are under the Chapter: Business @ the Speed of Thought, topic starting from number VII , in Kishore Biyani’s book: It Happened in India. Here he emphasizes the important of a Win-Win situation between his organization, his business associates and his customers. He says, if you approach your business with this framework in mind, then you shall see benefit in all interactions. However, this is not as easy as it sounds. To get to that level, every person’s aspirations & dreams have to be understood & more importantly, addressed appropriately. Therefore, to build great relationships, sacrifices will have to be made. I am almost half way through this amazing book. Will be posting the review here soon. *Update: Finished reading this amazing book by Kishore Biyani on how he built up this retailing revolution. This book is a must for all MBA students & aspirants, as well as all libraries in educational institutions. In fact, this book ” It happened in India ” is a must read for all entrepreneurs. I was planning to write a review on this book, all in one post, however, I have deferred this. I shall re-read this book again & review selected sections of this book. At Rs.99/- it’s a steal. I received my copy personally signed by Kishore Biyani, since I was in the first 100 to signup. 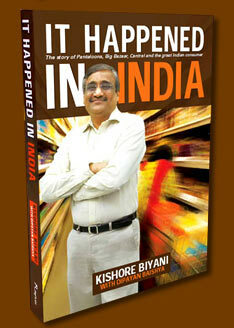 You can still buy the hardbound copy of It happened in India signed by Kishore Biyani on Future Bazaar website here. Click on the right hand side promo ad of It happened in India, which looks like this image above. Then proceed to purchase the book by first registering on the website by creating an account.